Popstar royalty Sarah Geronimo is a world-class Filipino entertainer and considered as one of the youngest, most popular and successful performers in Asia. 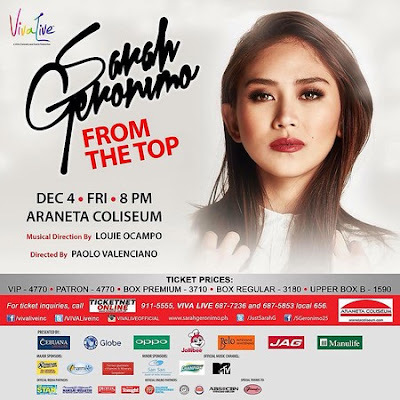 She is set to mark another milestone in her career as she returns to the Big Dome on December 4 with a new show entitled "From The Top". "From The Top" is under the musical direction of Louie Ocampo and promising director Paolo Valenciano. For inquiries, call Ticketnet at (63 2) 911-5555 and Viva Live at (63 2) 687-7236.